“This is absolutely a message to the U.S. government around these trade negotiations that the balance can tilt towards Airbus should it be resolved in a way that’s not mutually beneficial,” said one aviation industry expert. 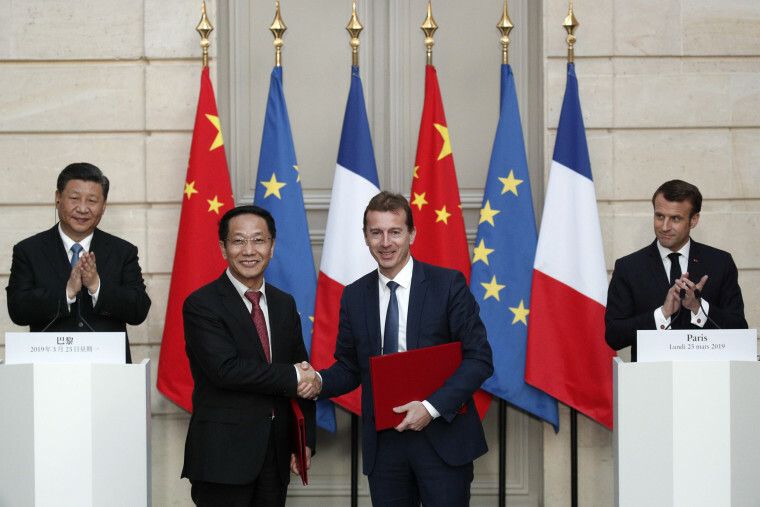 French aircraft manufacturer Airbus has announced a commitment from China’s state-run airlines to purchase 300 planes. The deal was signed during a state visit by Chinese President Xi Jinping — a symbolic gesture experts said expressed more about China’s global ambitions and its fractious U.S. trade relationship than about the troubles plaguing Airbus rival Boeing. “It’s impossible to divorce politics from anything China does when it comes to aviation and aerospace,” said Jon Ostrower, editor-in-chief of aviation-industry publication The Air Current. “This is how they show their displeasure, but I think it’s in a very small part about the 737,” said Richard Aboulafia, vice president of analysis at aviation consulting firm the Teal Group. Airbus said 290 of the planes ordered are in the A320 family of aircraft — a popular single-aisle model that is the main competitor to the Boeing 737, including the troubled 737 Max. The entire fleet of nearly 400 Max planes has been grounded as Boeing works on fixes to flight-control software that is suspected as a cause in two fatal crashes in five months. China was the first country to order the 737 Max grounded following the second crash earlier this month. Aboulafia suggested that quick decision might have been influenced by political and commercial as well as safety considerations. President Donald Trump’s aversion to multilateral institutions has left a vacuum in place of American leadership overseas, a vacuum into which China has been using its economic leverage to encourage Europe to look East rather than West. “The bigger trade issue with China is actually its relationship with Europe. You’re beginning to see a hardening of the European attitude towards China on trade and investment issues, and [French President Emmanuel] Macron has obviously been on the forefront of this,” said Jacob Kirkegaard, senior fellow at the Peterson Institute for International Economics. Last week, Italian Prime Minister Giuseppe Conte broke with the other leaders of the so-called Group of Seven and signed on to the sweeping Chinese Belt and Road Initiative infrastructure program. An initial investment of some $2.8 billion could eventually expand to be as large as $23 billion. Macron has been more skeptical of China’s growing influence and trade practices, recently cautioning fellow E.U. leaders that “European naïveté” could be exploited to Beijing’s advantage. “A state visit to Paris is obviously a great time for Xi to announce such a large order, because it’s going to be more difficult for Macron to turn around and take a hard line with China,” Kirkegaard said. This timing even could turn out to be fortuitous for Boeing as well, Aboulafia said. With a backlog of around 6,000 planes, Airbus isn’t in a position to take much market share from Boeing, which safeguards the 7,240 planes — worth $1.1 trillion — Chinese carriers are expected to buy through 2036, according to an outlook Boeing issued in 2017. That is, if tariffs don’t derail that recovery. “Boeing in this whole trade mess has effectively been an island where they haven’t been exposed to this yet,” Ostrower said, but that could change. “The timing is not coincidental,” he said. “If our trade war with China escalates, this is one of the cards China can play, and of course Europe will seek to capitalize on that situation,” said Rufus Yerxa, president of the National Foreign Trade Council. Kirkegaard said making a big purchase from an E.U. nation underscores Beijing’s unhappiness with Trump’s go-it-alone approach. “This is China’s way of saying there are other large economies out there and we can trade with them, and if you want to really talk, maybe you should try the multilateral route rather than the unilateral one,” he said. Ultimately, it’s a signal that China is willing to put this critical American export in play if faced with an escalation of trade sanctions.